Revolving doors are recommended when the thermal differences are large between two areas – airtightness being better achieved by peripheral seals. Sliding doors are chosen to reduce obstruction in passageways and opening can easily be made automatic. Swing doors are more adapted to frequently used passages between two areas of similar temperatures. 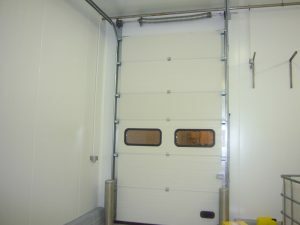 Flexible doors are used for movement between two areas with similar temperatures where there is a high passage frequency or in addition to another opening to limit thermal loss. The sections (panels) for the ISO insulated sectional doors are available in 3 different heights and in the most used RALs. 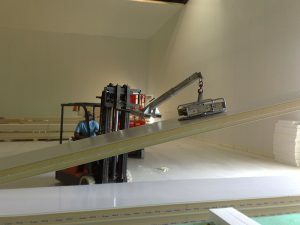 The heights were carefully selected in order to avoid cutting the panels. The heights available are 488mm, 610mm and 732mm. When bright lighting with natural light or vision through the steel shutters are desired, glass ALU sections offer the best performance. 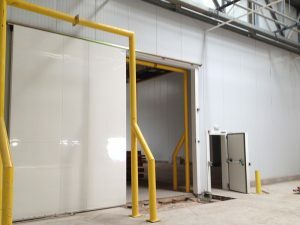 Unlike the structures made manually, the main European factories which make the sectional doors industrially are able to develop and make glass ALU sections of a very high quality, thanks to modern machines with digital commands. This means that the solutions they propose are far superior in terms of natural light, assembly and also in resistance to attempts to break in. We also offer double-glazed vision panels for ISO insulated steel shutters. 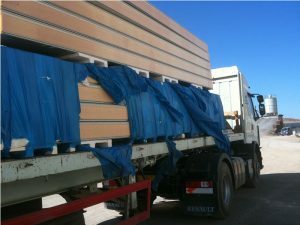 The ISO vision panels can be supplied from a wide range of forms and dimensions according to your choice. The necessity to have natural light at your disposal influences the position and number of vision panels used. It is often preferable to use glass ALU sections which are entirely transparent when a lot of light is required. If thermal insulation (insulation performance/U value according to EN 12428) is the most important criterion when you choose, double-glazed vision panels are the best choice for you. If maximum prevention of breaking and entering is your main criteria then double-glazed vision panels of reduced height is the best choice for you. Round, double-glazed vision panels can be fitted randomly in the insulated metal shutter. 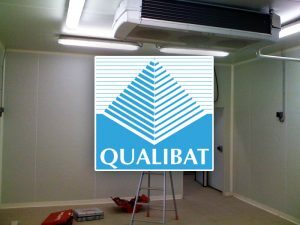 The construction of refrigerated premises demands a judicious choice and adequate installation of the isothermal panels which will form them. The criteria which are taken into account depend on their use; Wall – Ceiling – Partitions – Negative floors. As well as specific thermal needs of the different operation areas; Refrigerated warehouses or controlled atmosphere – Food-processing premises. In the area of food-processing, isothermal panels are recommended for the construction of the simple cold room of a caterer, to the refrigerated enclosures of the biggest companies with thermal constraints which can go from simple refrigeration to freezing. The thickness of the panels can vary from 40 to 220mm with different smooth or ribbed facings with several coatings. 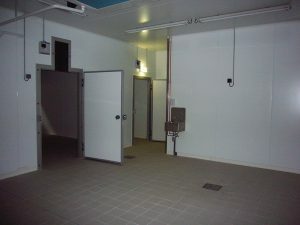 The choice of panel thickness must meet the thermal specificities of positive, negative or “hot” cold rooms. The choice of exterior coatings is made with regard to the ambient atmosphere surrounding the building and for the inside of the buildings it depends on the aggressiveness of the atmosphere, cleaning conditions and the hygrometry (insulation DTU 45-1). Assembling isothermal panels. The panels have male-female molded edge strips which allow simple or double interlocking depending on the thickness. Preferably the installation of the panels must be done by companies which have acquired the necessary Qualibat professional qualifications. Our teams of highly qualified fitters have carried out numerous projects throughout the French territory and even abroad in the area of food-processing but also in research, beauty care, electronics, aviation, pharmacy, wine and transport. 2-hour firewall panels (material components rated MO = rock wool and plaster firewalls) are used to create a wall to stop fires. This separation is designed to ensure that rescue services can stop the fire spreading. It is necessary to use interlocking panels with walls to stop flames spreading to the junctions. 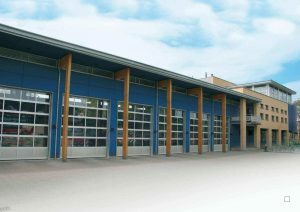 In order to stop the fire spreading to the outside of the building, a roof overhang is often recommended (see following paragraph). 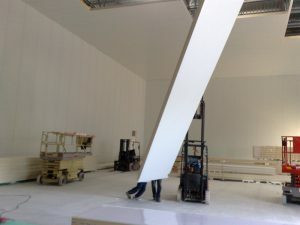 The use of panels has the advantage of combining protection from firewalls with airtightness and insulation. 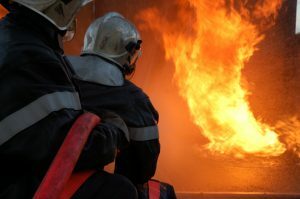 In the case of a separation of certain types of buildings or different parts of a construction, regulations or insurance companies can insist that firewalls stay in place to play their role, even if a part of the building collapses. In this case the main walls must be 4-hour firewalls (concrete structures). For these walls a roof overhang and also a lateral overhang are compulsory if the roof and the panels which contain the façades are not 2-hour firewalls and M0. If the firewall panels are installed as frontage they must be fitted on an independent, auto-stable Framework.